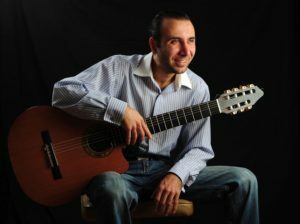 Artistic director of the Via Romen ensemble, Vadim Kolpakov who is a virtuoso Russian-Romany (Gypsy) seven-string guitarist, dancer, and vocalist. He has performed extensively in Russia and abroad, including at Carnegie Hall and the Kremlin. He has also participated in numerous musical projects on Russian, American and European television and radio. Since the mid-1990s, he has been a member of the Russian-Romany group the Kolpakov Trio, and in 2004 he assembled his own group in the United States, Via Romen. His musical repertoire includes 19th-century Russian seven-string guitar, and Gypsy, classical, rap, pop and world music. In 2008 and 2009, Vadim participated in Madonna’s Sticky & Sweet world tour as a part of The Kolpakov Trio.